According to a recent study, one in every four people in the UK will experience mental health problem at some point in their life and one in six adults has mental disorders at any one time. This situation is costing the United Kingdom 8.4 Billion pounds every year and the loss in productivity is reaching 15.1 Billion pounds. 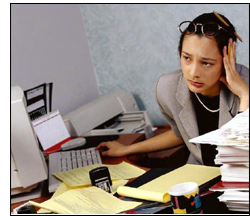 It is very evident that the workplace is one of the most stressful places that every individual has to go. There is always the pressure of the bosses, pending tasks that pile up, worries about home and other personal problems, and a lot more. Add the allocation of monthly salaries to pay for the bills. There is no wonder why in the office, the main cause of absenteeism is caused by psychological or mental problems such as anxiety and depression. The Charity’s Taking Care of Business Campaign has pointed out a disturbing number of employees who admitted they feel stressed and even depressed at work. Of the survey made, 41% of employees who used to get absent considered stress as the cause of their absences and 46% take vacation leaves merely an excuse for other things. There are also cases where employees who have disclosed mental problems with their superiors were later sacked out from the office. The Mental health Charity Mind is advocating towards a very supportive work environment where employees can face issues of stress and other mental problems freely. They also encourage businesses and different companies to introduce mental health policies and programs that will enhance productivity by giving the employees and staff an access to help and support in coping with anxiety and mental disorders. One of which is providing free counselling to the workers. Another proposal was given by a group of researchers headed by Dr Tina Bringslimark, a psychology expert from Norweigan University of Life Sciences, and Uppsala University in Sweden. According to their research, putting plants in the office has beneficial effects on employees especially in relieving stress, fatigue, headaches, common colds and coughs, etc. It is also important that the workplace should project an atmosphere conducive to all. Efficient counselling sessions can absolutely uplift the morale and productivity of employees. There are other factors that need to be taken account for. Sometimes, it is not just the stress that results to mental breakdown in the workplace but also issues on employee disputes, bullying, security of job and promotions can also affect the well-being of employees. There are many approaches for counselling. Some businesses provide for one-on-one counselling session for each member of the staff. The worker can be open and relaxed in discussing his/her issues without the worry of being discriminated. Counselling can also be in form of phone calls. Sometimes, people just can’t be open to someone else in person. Psychotherapy through emails and chat sessions are also being pushed nowadays for those who have no courage to confess in person. Reviving the spirit of enthusiasm and energy to workers is the best way to ensure their productivity. Businesses should be able to acknowledge the fact that the success of their companies depends on their workforce. Thus, ensuring wellness in the part of the staff is indispensable. © Copyright 2011 by http://www.NaturalTherapyForAll.com Counselling York - All Rights Reserved.